Game description: The Hulk takes place one year after the events in the film, with troubled scientist Bruce Banner and his enraged alter ego, The Hulk, forced into action once again. A new villain, known as The Leader, plans to use The Hulk's gamma energy to unleash a relentless army of gamma creatures on the world, and only you can stop him. Employ the powers of stealth and logic as Bruce Banner, or command the incredible strength and fury of The Hulk. Take down your foes in fully destructible environments. The Hulk's 25 attacks can hurt your foes and can also destroy your environment. 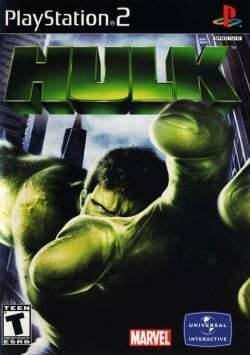 Set about 1 year after the events of the film; The game begins in a dream sequence where a man named Bruce Banner transforms into a large and powerful monster dubbed the Hulk and destroys waves of soldiers and tanks sent by the military to attack him. Upon awakening, Bruce Banner is contacted by his old mentor Dr. Crawford who explains that he has developed a cure for the Hulk called the Gamma Orb. Unfortunately, military troops led by the corrupt General John Ryker have raided the lab. Game seems to work fine at good speed., Gsdx HW mode results in messed up shadows and strange black lines around Hulk. This page was last edited on 3 May 2018, at 17:22.